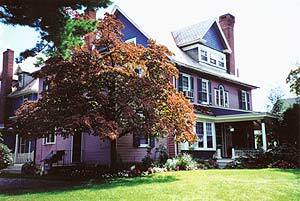 The Victorian Rose Bed and Breakfast is located in the quaint town of Mount Joy, Pennsylvania. Located in Lancaster County, it is a short drive from the Amish tourist area and Hershey. We have four exquisitely designed rooms that are comfortable and affordable. The Victorian Rose is smoke and pet free inside. Smoking is allowed outdoor on the large porch. Children are accepted on a case by case basis. Two night minimum stays apply over holiday periods and the month of October. Rooms must be held with a valid credit card. Reservation cancellation is 72 hours.